This is our brand new computer desk, which can provide you a unmatched convenience for your work with its large workstation. Featuring high quality MDF board and powder-coated iron, this computer desk is sturdy and anti-corrosion so that it provides years of sturdy and reliable use. 4-tier shelves attached to this desk offer extra storage space for your daily supplies such as pen holder, potted plants, books or magazines. And the height of the desktop can be adjusted between the bookshelves on the second and third tier. Anti-skid table legs pad makes it stand stably and avoids scratching floor. Don't hesitate to add it to your cart! 【Integrated Design】Our Tangkula computer desk features a simple , modern and compact appearance. It comes in with 4 tier bookshelves which can provide plenty of storage and display space for you. And the height of the desktop can be adjusted between the bookshelves on the second and third tier. The computer desk is practical and also perfect furniture to decorate your home study room or workplace. 【Multifunction】With 4-Tiers Shelves, can storage your books, CD, potted plants, beautiful pictures and so on, spacious desktop can lay your books, papers, documents, laptop. It can rich your working and relaxing life. 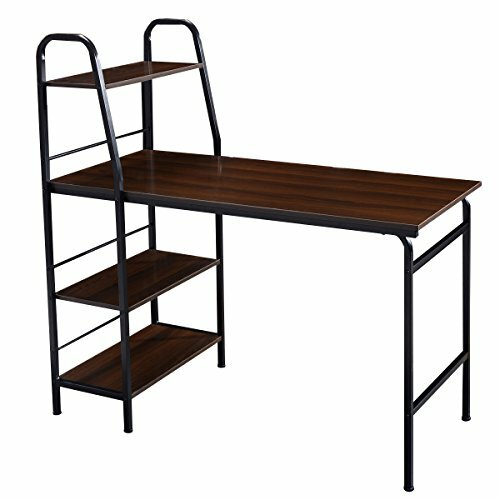 This computer desk is excellent be used as business office workstation, home desk, computer desk, gaming notebook desk, study desk for kids etc. 【Sturdy & Durable Construction】This computer desk constructed by high quality MDF board and iron tube, which ensures sturdy and durable, features rustproof and corrosion resistance. It provides skin-friendly work surface and lets you spread out comfortably, totally maximize the daily working and reading enjoyment. 【Easy to Assemble & Maintain】With all accessories and clearly assembly instruction, the awesome computer desk will very easy to install. And with wet cloth you can wipe dirty stain easily from the surface.